What is a Maryland Sublease Agreement? Maryland Sublease Agreement: What Is It? 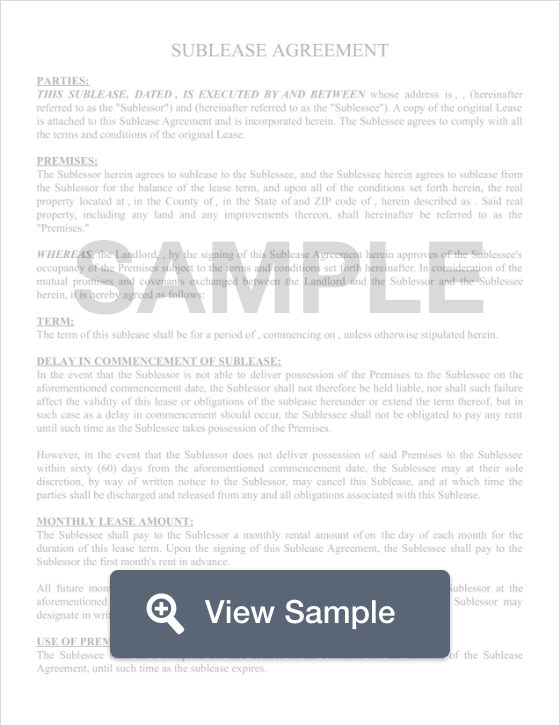 In Maryland, sublease agreement is a legal contract between two tenants; a sublessor and a sublessee. A sublease agreement is used when a person who originally signed a lease to an apartment (a sublessor), in turn, leases the apartment or rental property to someone else (a sublessee). This situation is common and occurs when a tenant signs a long-term lease, but experiences a change that the rental cannot accommodate. For example, if a tenant is locked into a year-long lease, but their job requires them to move to another city for four months, they may look into a subleasing their apartment. Rather than breaking the lease, or paying rent in two locations, the tenant may choose to sublet their apartment to another renter. Despite the fact that the sublessee will be living in the apartment and paying rent, the original tenant will be held responsible should any damage or late rent payments occur during the sublease agreement. Maryland Tenant/Landlord law delegates that a landlord cannot unreasonably deny a tenant’s request to sublease a rental. If a landlord wishes to deny a tenant’s sublet request, he or she must present a valid reason for such a rejection.